Wishing you a wonderful holiday season and a joyous New Year. On October 12th at the Four Seasons Hotel in Boston Massachusetts, Pinnacle Financial Group hosted a symposium sharing recent experiences and insights in the private placement life insurance (“PPLI”) marketplace. The symposium consisted of three panel discussions focused on recent experiences by MFOs in engaging clients in PPLI, international planning applications of PPLI and perspectives from three funds available on multiple PPLI platforms. The presentation concluded with a reception. GOP/Trump Tax Cuts – Bad for pretax compensation deferral? Over the course of a working career, I’ve seen higher taxes during the Clinton administration, lower taxes during Bush 41, higher taxes during the Obama administration, and lower potential income taxes now. What we should be focusing on is the long term outcome of our planning, and what our lives are going to be like for our future selves and families. Participating in a nonqualified deferred compensation plan could provide a critical component of your future income, so let’s talk about the strategy and potential impact if you do or do not participate. The possibility of lower personal federal income tax rates across the board is high. Does this mean you should stop deferring compensation into your company’s nonqualified deferred compensation plan? The answer is: “It depends.” Enrollment to defer performance bonus compensation into nonqualified plans must be completed by June 30, 2017 for many plans, and the recent Trump tax cut proposal makes the decision more complicated. This article provides a perspective on how you might work through questions in order to help decide whether to defer pretax compensation. Many executives and highly compensated employees have access to nonqualified deferred compensation plans; in fact, over 80% of large public and private companies offer deferred compensation plans as a vehicle for executives to save for the future above and beyond qualified plan limits. 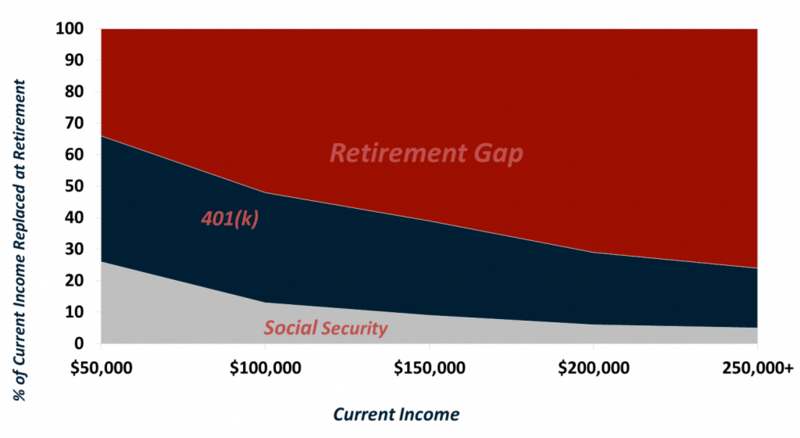 Many executives use these plans to lower current tax costs and build wealth tax-effectively because they realize that they will not be able to maintain their lifestyle during retirement on 401(k) and Social Security funds. Before we jump into the Trump tax proposal, it is worth reviewing the basic concept of pretax income deferral. Many people are under the false impression that deferring pretax compensation only makes sense if you have a long time horizon until distribution. This is not the case. Deferring for as little as one year provides an economic advantage assuming no change in tax rates during the year. But the longer you compound pretax earnings, the greater the advantage. What if the deferral were for a 45 year old who defers $100,000 one time, retires at age 65 and takes distribution over 15 years? The advantage would be 52%, see the chart below. 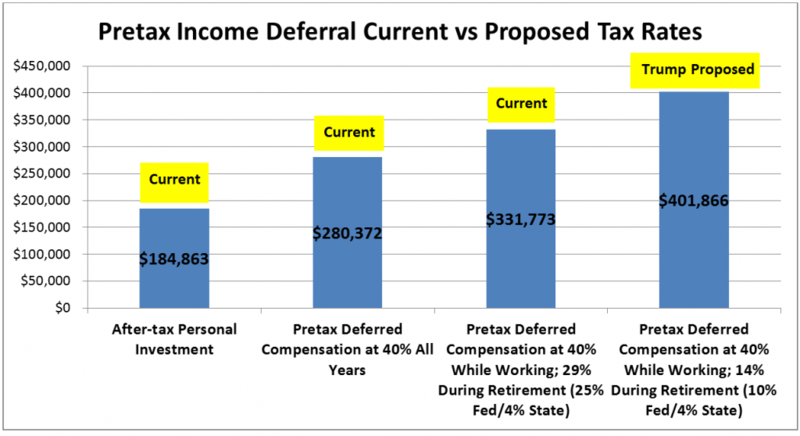 Consider the advantage of deferring if effective tax rates during retirement are lower since you are no longer working and may be in a lower federal bracket? Further, what if you earned the income while working in California, New York or New Jersey where state rates can be 7%, 8% or even greater than 10% for high income earners? If you retired in Texas or Florida, and took payment over 10 years or more, there is no state income tax and the advantage would be even greater. *Note in April Trump did not announce income brackets, only the three rate classes. So the above chart uses income brackets from previous Trump/GOP proposal. Let’s discuss how current proposed tax rates may affect pretax compensation deferral. 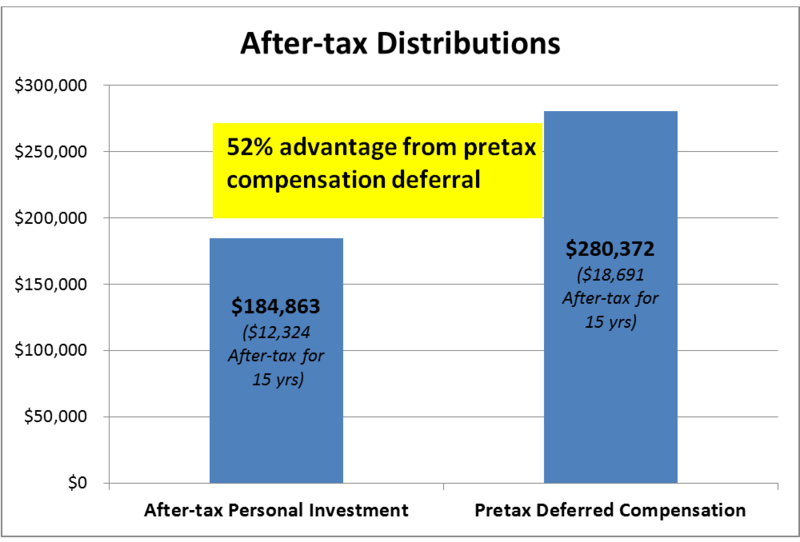 In the previous example, we assumed pretax deferred compensation was taxed at 40% (federal plus state) while working and during retirement. But actually, many people are using deferred compensation plans to build a “bridge” that will allow them to delay taking qualified plan distributions and Social Security until ages 65-70, allowing them to retire as early as age 55 or 60. Since nonqualified plan balances are at risk in corporate insolvency, many plan participants choose to “monetize” nonqualified plan balances prior to qualified plan assets. Some choose to live on deferred compensation distributions from age 60-70 allowing them to delay distributions from qualified plans and Social Security until more economically advantageous. As a result, you have the option to limit what you draw from retirement savings to only nonqualified plans in the early years following your retirement. If at retirement, your AGI is less than $100,000, the spread between tax rate at the time of deferral versus the tax rate at distribution is greater under the Trump/GOP bill than it is currently. Consider someone with current AGI between $250k and $400k, who distributes less than $100k/year during retirement, the spread is 8% (33%-25%) in current tax environment versus 25% (35%-10%) under Trump proposal. Your economic advantage grows if you are able to distribute after retirement and AGI is lower. Your advantage grows even further under the Trump proposal. 1. If you spend everything you make and have no current disposable income, then pretax deferral is not for you. Note, most plans allow you to defer for as little as three years so if you are saving for kids college, you can still defer and access balances near term. 3. If you believe your personal income tax rate/bracket will be higher upon distribution versus contribution, then pretax deferral may not be for you. Why? Because, even with a higher tax rate at retirement, depending upon the magnitude of the increase, the pretax contribution and pretax compounding drives economics that can overcome a higher rate or bracket. One way to avoid a higher rate/bracket is to delay distributions until you are no longer actively working and make sure to spread payments over a period of years since one large lump sum payment can bump up one’s rate and bracket. Deferred compensation is a great tool for executives to save for the future, but it requires significant education, thought and planning to ensure you can maximize the benefits of these plans. David Hauptman is a Managing Director with Pinnacle Financial Group, a division of HUB International. The above illustrations are hypothetical illustrations to show the effect of the Trump Proposed tax changes verses the current rates. On December 1, 2016, Hub International, one of the world’s largest insurance brokers and risk management firms, acquired Pinnacle Financial Group. Pinnacle will now operate a separate division of Hub International, and it will continue to offer its specialized private client, private placement investing and executive benefits to its clients as well as those of Hub International. On October 6th at the Four Seasons Hotel in Boston Massachusetts, Pinnacle Financial Group hosted a symposium where PPLI expertise and insights were shared. The symposium consisted of three panel discussions focused on insurance dedicated funds and separately managed accounts, estate and wealth planning solutions coupled with PPLI and perspectives from advisors and funds. The presentation concluded with a reception. On October 26th, Michael Mingolelli, Jr. spoke at the M Technology Specialty Meeting in Chicago. His focus was ‘utilizing and leveraging technology in our practice.’ Michael spoke about the firm’s marketing, sales and social media focus and how technology initiatives provide advantage over other market participants. At the Annual PPLI & PPVA Forum, held in Boston this year, Pinnacle consultants shared their experiences and insights during three different presentations of which included using investments and insurance, expertise and infrastructure required to service PPLI & PPVA investments, and tax and regulatory landscape surrounding these products. Attendees at the conference included family offices, hedge funds, insurance carriers as well as insurance brokers. David Hauptman presented to members of the Association for Advanced Life Underwriting (AALU) on designing, implementing and funding executive benefit programs. AALU is the premier life insurance advocacy group based in Washington, D.C..
At a program entitled “Sophisticated Estate Planning: The Latest Cutting Edge Techniques” held in Boston, Michael Mingolelli, Jr. served as a panelist and discussed split dollar life insurance planning as well as investing through private placement insurance structures. In Greenwich Connecticut at a program entitled “GPS, PMs and UHNWs Taking the Next Step: Launching Family Offices” Marc Mingolelli served as a panelist and shared recent trends on family office investing, with particular focus on emerging trends in private placement insurance investing.